Part of the 16th century Moot Hall in the quiet fellside village of Ireby. The village is on the fringe of the Lake District National Park in an area known as 'Back o' Skiddaw'. There are lovely walks from the door. The nearby Uldale Fells provide gentle to strenuous walks on near-deserted paths. Keswick and Derwentwater are a scenic 12 mile drive and the Solway coast and Hadrian's Wall are easily reached. The cottage is part of the 16th Century Moot Hall, it is cosy and well-furnished and enjoys lovely fellside views. There is a double bedroom and a twin bedroom and a bathroom with an over bath shower. Parking is free in the village. The cottage sleeps 4 adults. Please note that children are welcome and there is a fireguard and travel cot (no bedding) but no stairgates or high chairs, therefore this cottage is more suitable for older children. There is sadly no longer a shop in the village but there is a general store and Post Office at Caldbeck (6 miles away) and supermarkets at Cockermouth, Keswick and Wigton. Dogs welcome free; reductions for Rescue and Assisstance dogs. Take the Carlisle road from Keswick, past Bassenthwaite until you reach the Castle Inn. Turn right at the sign marked Ireby, Uldale and Caldbeck. Follow the road for 4 miles. Upon reaching the village, 2 Moot Hall can be seen to your left. 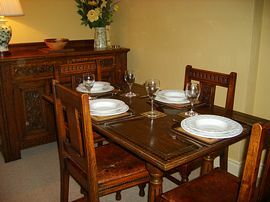 From £250.00 to £360.00 per week for 4 persons. Reductions for 1, 2 or 3 persons. Sunday to Sunday, short breaks sometimes available.